The regular season rankings are set as we enter the playoffs for all classes! The regular season is complete and it’s finally playoff time! Here’s a look at the Kpreps Rankings for October 31st. There are no changes in the Class 6A poll this week as all five teams rolled to Week 9 wins in the 6A bracket. Top-ranked Derby cruised to a 62-0 shutout of Wichita North, while No. 2 Blue Valley shut out Shawnee Mission South 54-0. On Thursday, No. 3 Shawnee Mission East handled Shawnee Mission Northwest 55-15. Manhattan and Garden City round out this week’s poll as both eliminated Wichita City League schools. Manhattan beat Wichita Southeast 63-20, while Garden City beat Wichita East 49-14. Great Bend remains ranked No. 1 after the Panthers outscored Topeka West 70-31 to open the 5A bracket. The Panthers will once again be at home this week against Andover. The Trojans are coached by former Great Bend coach Tony Crough who left the Panthers for Andover after last season. A big match-up will occur this week in Goddard as the No. 4 Lions will host No. 2 Bishop Carroll. Both teams rolled to first-round wins in the 5A bracket. Carroll defeated rival Kapaun Mt. Carmel for a second consecutive week, while Goddard shut out Salina South, 52-0. Wichita Heights remains in the No. 3 spot this week after the Falcons’ 55-0 shutout of Salina Central. Topeka Seaman rounds out the top five. The Vikings defeated KC Harmon 61-22 and will host KC Turner this week. In 4A, Division I, Bishop Miege completed district play with a 57-19 win over Spring Hill. The Stags will open the Class 4A-I playoffs at home against KC Piper. Second-ranked Basehor-Linwood remained unbeaten with a 27-12 win over rival Tonganoxie. 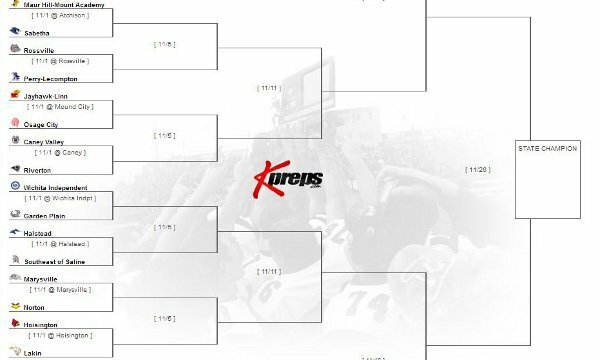 The Bobcats will host a talented De Soto team in the first round next week. Buhler remains ranked third after outscoring Towanda-Circle 65-40. The Crusaders got the game well in control and played several younger players as Circle continued to put up points. Buhler will host Abilene in the first round this week. Andale claimed the district runner-up with a 39-18 win over El Dorado. The Indians will travel to McPherson this week to open the playoffs. Finally, No. 5 Maize South shut out last year’s state runner-up Andover Central 49-0. The Mavericks will host Ulysses this week. Frontenac heads into the playoffs as the top-ranked team in Class 4A, Division II. The Raiders shut out a solid Baxter Springs squad 48-0 to finish the regular season. Pratt remains at No. 2 this week after shutting out Kingman 35-0, and Holcomb is No.3 after a 40-point win over Hugoton. The Longhorns will travel to rival Scott City to open their state title defense. Fourth-ranked Topeka Hayden cruised to a 50-point win over Jefferson West, and No. 5 Columbus handled Parsons 45-6. Columbus will also open the playoffs on the road at CNC-rival Girard. The Titans defeated the Trojans 22-6 back in Week 3. There are no changes in the Class 3A poll this week as all five ranked teams rolled to double-digit wins. Top-ranked Hoisington had little trouble with Lyons in a 62-3 win, while No. 2 Silver Lake overcame a slow start to blast Royal Valley, 50-0. Phillipsburg won by 50 over Russell last week, and the defending 2-1A champs will open the 3A playoffs at home against Riley County. Rossville, ranked fourth, is the defending 3A champs. The Bulldawgs beat Council Grove 42-8 last week and will host a solid Perry-Lecompton team in the first round. Finally, Nemaha Central rounds out this week’s poll after defeating Hiawatha 54-8. We have a slight change in the Class 2-1A poll this week as Lyndon dropped their first game of the season in a 26-20 loss to Olpe. The Tigers still claimed the District 3 championship, however, as they finished with the most marginal district points ahead of Olpe. The Tigers dropped one spot to No. 5 in this week’s poll, while Washington County occupies Lyndon’s prior spot at No. 4. Washington County scored late to overtake Valley Heights, 42-36 and win the District 2 title. The top three in the 2-1A rankings remain unchanged with top-ranked Troy, second-ranked Plainville, and third-ranked Smith Center all cruising to big wins. Defending 8-Man, Division I champion Spearville is once again on top of the poll this week by one vote over No. 2 St. Francis. The Lancers shut out Kinsley 72-0 last week, while St. Francis blasted WaKeeney-Trego 54-0. Third-ranked Burlingame picked up an impressive 46-0 shutout of a seven-win Herington team, while No. 4 Osborne blasted Lincoln 78-16. Central Plains, ranked fifth, went on the road and beat Goessel 60-12. There’s no change in this week’s 8-Man, Division II poll. Hanover remains on top as one of two remaining unbeaten teams in the classification. The other is third-ranked Dighton. Pike Valley remains in the No. 2 spot after a 48-0 shutout of Linn. Hartford is ranked fourth this week, while Sharon Springs-Wallace County remains in the fifth spot. The Wildcats open the playoffs on the road at Stockton.